A Fashion student from Nottingham College has beaten off stiff competition from university-level students across the region to win the midlands heat of the SDC (Society of Dyers and Colourists) International Design Competition. Fashion and textile design undergraduates from across the world were invited to enter the competition, which this year is themed on Colour and Nature. 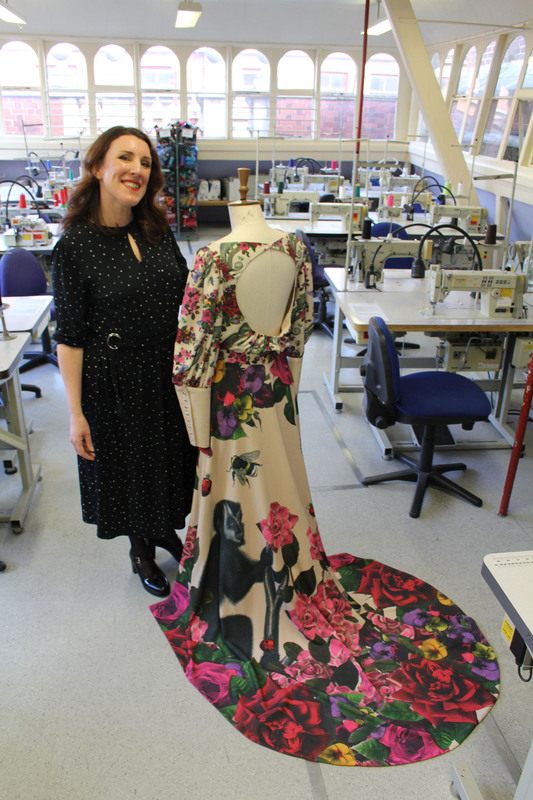 Sarah Gotheridge, who is studying BA (Hons) Art & Design at the College’s City campus in the Lace Market, designed a red carpet evening gown, featuring brightly coloured animals and insects including chameleons, ladybirds and a monkey. Sarah, who is 45 from Mickleover in Derbyshire, will now progress to the national stage of the competition in York on the 10th May, and if successful will go on to compete in the global grand final, which takes place later this year with finalists from around the world. “I was absolutely gobsmacked to win, I’m over the moon, and this is the first time the College has won this award so I feel really proud about that. I’ve received so much support from my tutors and I’m so grateful that they encouraged me to enter the competition. “My inspiration behind the design and why it’s so vivid and bright came about as I was researching the topic and found out a really interesting fact about chameleons. I always believed that they changed colour to adapt to their surroundings, when in actual fact they change colour according to their mood, so when they are excited they turn neon green! The competition aims to help entrants develop their understanding of colour and the challenges around sustainability in the textile supply chain. “With a showpiece like this you could probably only wear it once, which from a sustainability point of view is a complete waste. With that in mind I created three separate garments a blouse, a skirt and a train, which can all be worn individually - but come together to create an evening gown. I’m all about making really good quality garments that are going to last, and I’m so pleased with the final piece.